They always seem to show up in Autumn. At harvest celebrations, Halloween parties, and school events. Filled with nuts, pretzels and M&Ms, they're a big, scary NO-NO for peanut-allergic kids. 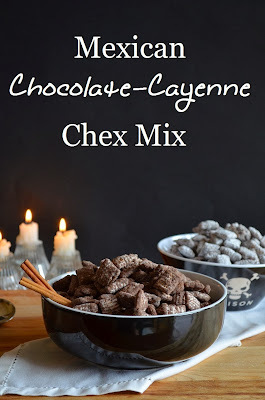 I'm talking about Chex party mixes. It seems like there's a bowl where ever we go this time of year. 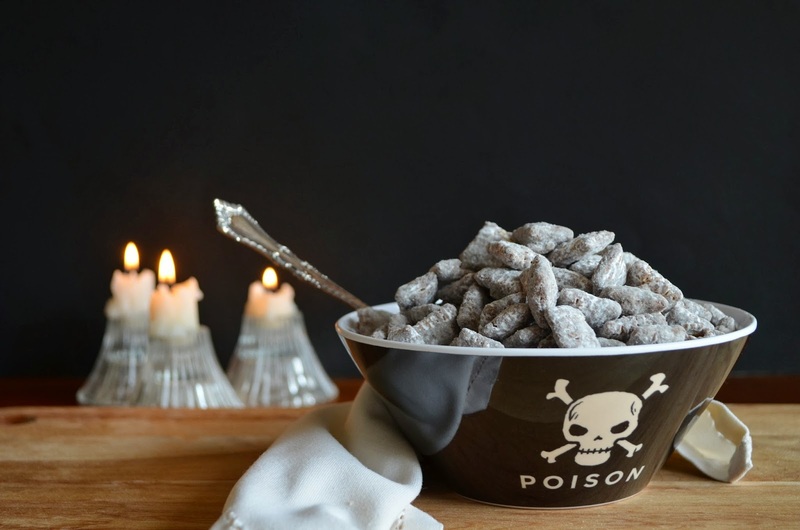 As a kid, one of my favourites was called "puppy chow." Nowadays it bears a slightly more appealing name - Muddy Buddies. 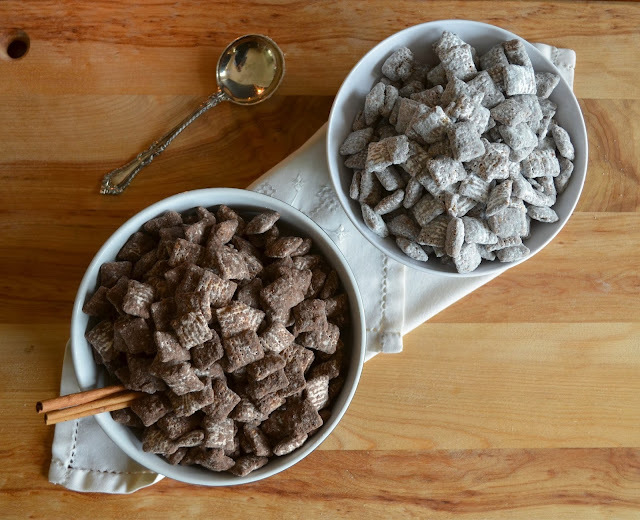 That ubiquitous mix of chocolate and peanut butter, dusted with a shower of powdered sugar, was a staple at every sleepover and camp out. It was ever SO good! And, like arsenic, it's oh SO dangerous for my peanut allergic Eve! A cloying but deadly POISON! So last weekend, when we were invited to a family picnic, I made a peanut-free version of the classic mix. I like to call it "Sunny Buddies" since it's made with SunButter instead of peanut butter. It's a cheerful, more appetizing name, don't you agree? Take it to the next level by browning the butter before mixing it in. This gives it a rich, "nutty" flavour, but is, of course, entirely optional. Naturally, when the kids get a special treat, I have to make something for myself, too. This time I made my Mexican Double Chocolate Cayenne mix. This is the chocolate aficionados party mix. It's chocolate at its purest, most intense. Dark, indulgent, and enhanced with the flavours of cinnamon and cayenne pepper. It pairs well with a bold California Zinfandel, if you're into that sort of thing. Make it as spicy as you like. 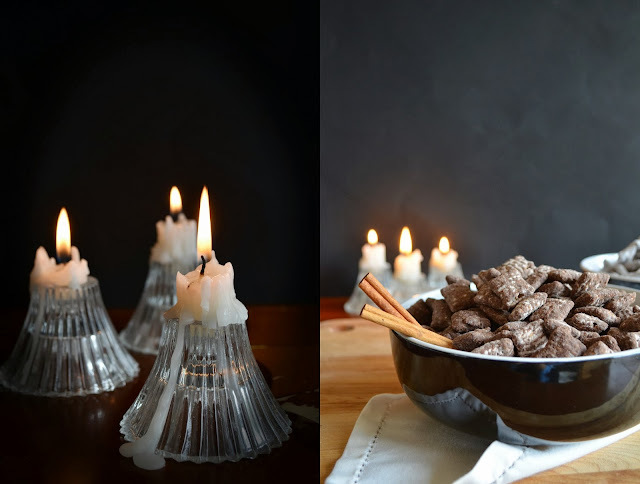 This is the sophisticated, grown-up version of Chex mix. Sophisticated Chex Mix - is that an oxymoron? 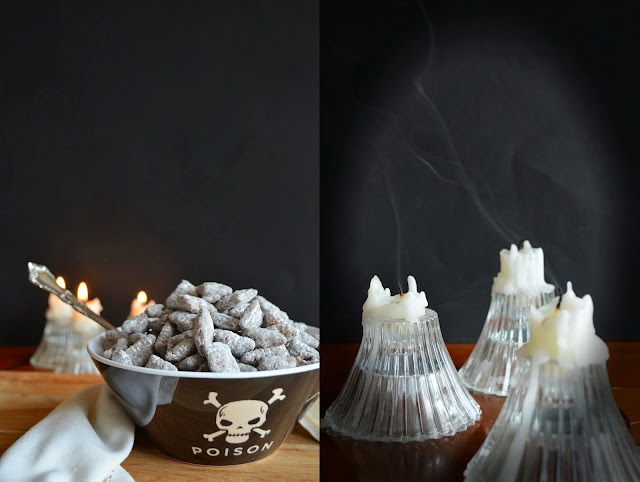 I hope you're inspired to make your own nut-free nibbles. They're sure to keep both kids and grown ups happy. Oh, and did I mention that they're both gluten-free? So, go ahead, indulge! *Obvious and unnecessary kitchen note: "Sunny Buddies" look EXACTLY like the traditional mix, made with peanut butter, so I've specifically instructed my daughter to eat only the ones that I've prepared. She knows that any other mix will be made with peanut butter, and will be called "Muddy Buddies." And we don't want to eat mud! I hope that the name change will help her differentiate between the two. In any case, she knows to only eat the Chex Mix that I have determined to be safe and peanut-free. Measure out the cereal into a very large mixing bowl and set aside. Bring a small pan of water to a simmer and place a heat-safe bowl on top (making sure the water doesn't touch the bottom of the bowl), to create a double boiler. Combine the chopped chocolate and the SunButter in the bowl, and heat, stirring occasionally, until melted and smooth. Meanwhile, in another small sauce pan, melt the butter over medium heat, stirring occasionally. Continue to cook the butter until it has stopped foaming and is a nutty, golden brown colour. Immediately pour the brown butter into the chocolate mixture and stir until smooth. Stir in the vanilla. 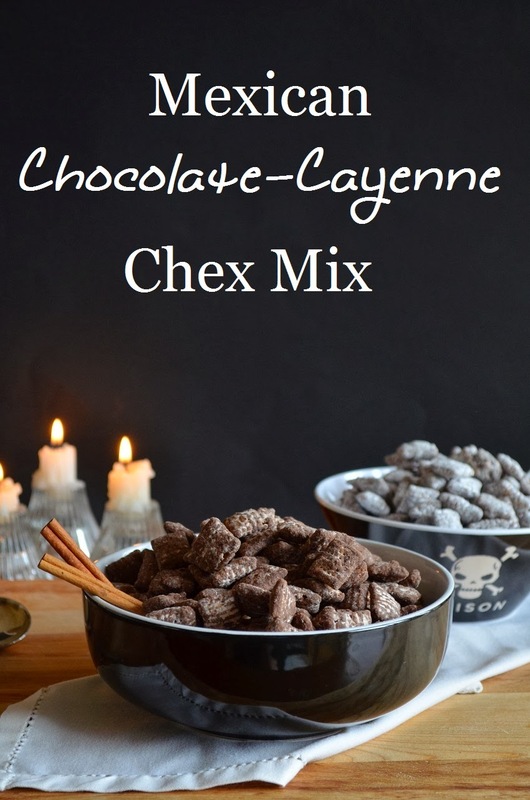 Pour over the chex cereal, and stir gently until evenly coated. Divide the cereal between two 1 gallon-size ziplock bags. Place 3/4 cup powdered sugar into each bag. Seal and toss until the sugar evenly coats the cereal. Store, sealed in the bag, in the refrigerator until ready to serve. 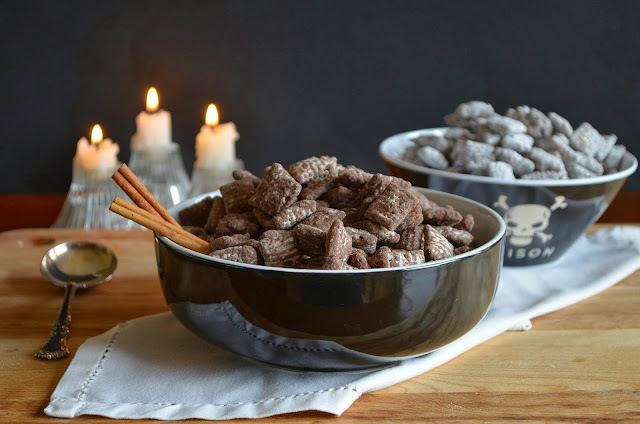 Measure out the Chex into a large bowl. Set aside. In a double boiler, melt the butter and chocolate. Stir until smooth, then stir in the vanilla, cinnamon, and cayenne. Pour over the cereal, and mix gently until the cereal is completely coated. It will look like there's not enough chocolate to go around. Just keep stirring, and there will be. Place the cereal in a large ziplock bag. Sift together the powdered sugar and the cocoa powder. Pour over the cereal in the bag. Seal the bag and toss until coated. Sprinkle in the salt and toss again. Refrigerate, in the bag, until ready to serve.